If you have already seen my imgur post on the Nerf sub-reddit, then most of this will be review. That said, I will be going over the mods I’ve done, so far, on my Han Solo blaster, as well as my opinion of the blaster, and my future plans for it. When BoomCo was announced in early 2014, I was curious. When a toy giant like Mattel decides to throw their hat in the blaster ring and take on the reigning champ, you take notice. However, I had my reservations. The designs were unique, the color schemes were cool, and Mattel was trying new things. Unfortunately, some of those new things had no triggers, and were obviously designed for a younger demographic. One of the major things that turned me off to BoomCo, at the start, was the darts. Don’t get me wrong, I am open to new ammo types. I loved Nerf Vortex (while it lasted). I like some of the Nerf Mega line. I’m excited about where Nerf Rival is going. Heck, I used to rock a Koosh Vortex Tornado back in the day. However, BoomCo’s propriatary darts seemed to be specifically designed for target shooting. Smart Stick Darts that have been designed to stick only to photo paper targets are an impressive feat of chemical engineering, but I don’t often find myself shooting at people that are covered in photo paper. So, I figured that BoomCo wasn’t for me, and I left it alone. My interest was rekindled with the announcement of BoomCo’s Halo blasters, not because I’m a Halo fan, but because I’m a prop maker. I decide to give BoomCo a try. 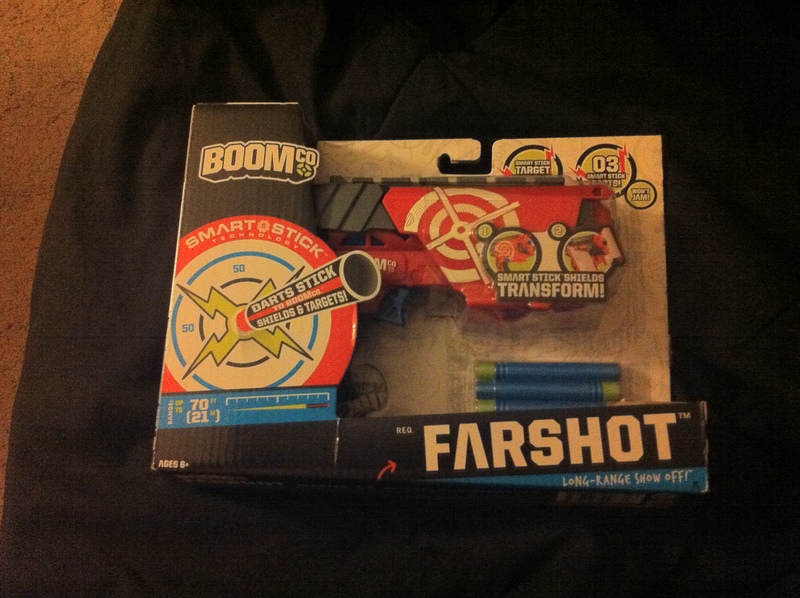 The opportunity came in the form of a Farshot on clearance at Walmart for $3. 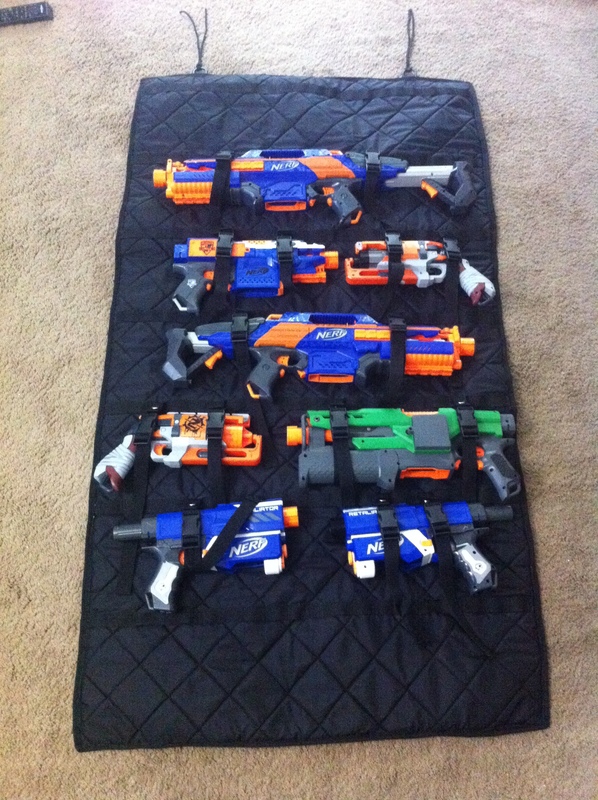 I promised my overall opinion of the Nerf Rival line, and here it is. As a disclaimer, I must admit that I only have first hand experience with the Apollo. After much deliberation, I have chosen not to purchase a Nerf Rival Zeus MXV-1200 at this time. Don’t get me wrong. I love the idea of a magazine fed flywheel Rival blaster, and I hope Hasbro makes more. However, the limited magazine size (12 rounds) and the awkward magazine changes make the Zeus unsuitable as a primary, in my opinion. As an aside, my regular readers have probably noticed that I do not review every new blaster as it comes out. I leave that to the Youtube reviewers who get free promotional PR packages, and/or have a larger budget than I do. As my hobby budget is limited, I have to be selective of the blasters that I purchase. Both the Apollo and the Zeus serve as excellent “proofs-of-concept.” With these blasters, Hasbro has proven that the technology is there. Higher velocity, more accurate, “off the shelf” blasters are a reality. The Rival blasters prove that they are not just another gimmick (i.e. Modulus, Elite-XD, etc. ), chiefly because they live up to their claims. What is needed next is refinement, specifically in the areas of ammo capacity, ergonomics, and usability. To be specific, I would like to see an ergonomic, high capacity (18+ rounds), pump action or flywheel primary, with a mag change as smooth as the Apollo’s. Most of all, I want to see a sniper style blaster that lives up to its looks. I’m not asking for a miracle. I just want something that is capable of accurate shots over 50 feet, and looks as cool as a Longstrike. Whether, or not, Nerfers will be willing to trade in their darts for “high impact rounds” remains to be seen. However, initial reception seems to be enthusiastic. Ultimately, the success of the line hinges on what Hasbro does next. 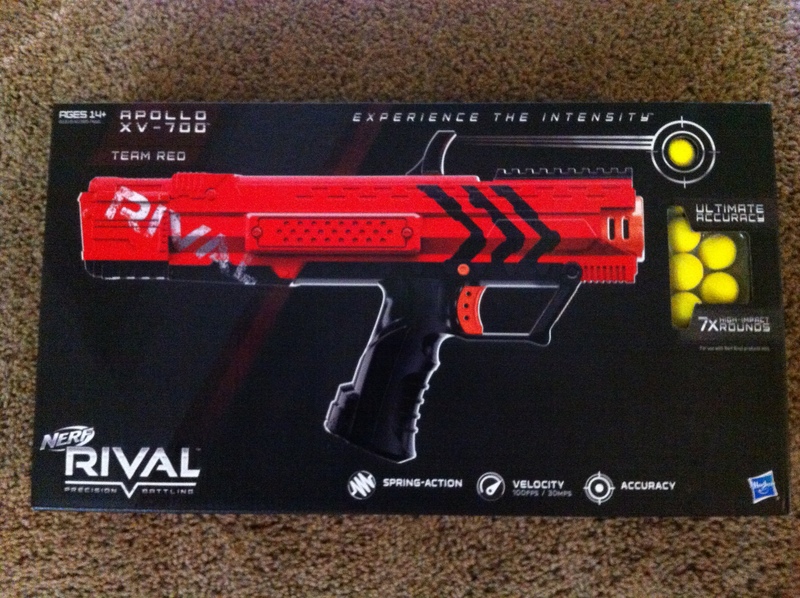 Today I’ll be breaking down my thoughts and observations of the new Nerf Rival Apollo XV-700. (Come on, Hasbro. That’s no name for a blaster, that’s a name for a rocket.) I picked this one up at my local Target. The box design for the Rival line is unique. Gone are the child models. In fact, the front of the box simply showcases the blaster itself and the new ammo (aka High Impact Rounds). We are told that the blaster is spring powered, boasts a velocity of 100fps (feet-per-second), and is accurate. The back of the box has the same information as the front, with the addition of the standard blaster feature diagram, and a bit on the red vs blue marketing campaign. Notice the Rival logo. 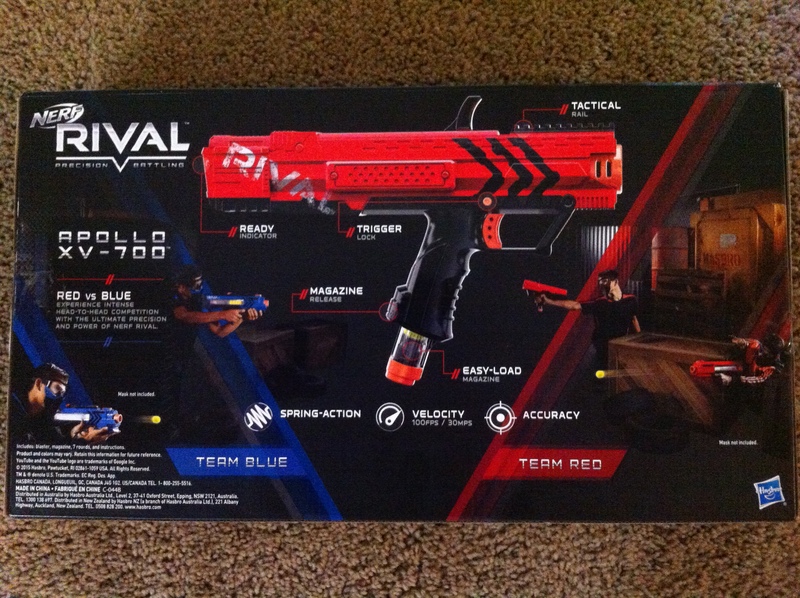 “Rival” is printed much larger than “Nerf”. 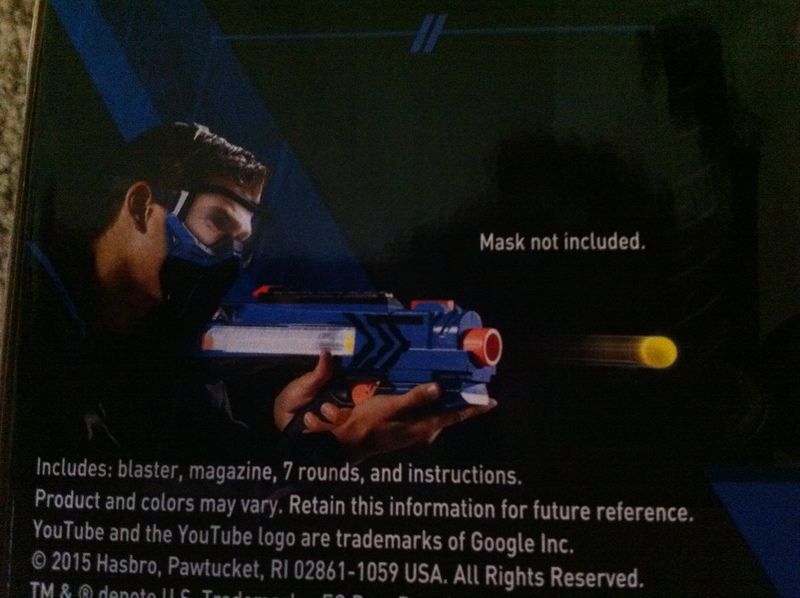 Hasbro seems to want a clear distinction between Rival and their other Nerf lines. The blaster’s name seems to adhere to Hasbro’s usual naming conventions. We have the common name of the blaster, “Apollo,” followed by a couple of letters that hint at some feature of the blaster, “XV,” (my theory is that XV stands for eXtreme Velocity) and finally we have a number indicating ammo capacity, in this case “700” denotes an ammo capacity of 7. I think calling it the Apollo XV7 would have sounded cooler, and made more sense, but I digress. As an aside, the back of the box seems to depict a pre-production/prototype version of the Rival Zeus MXV-1200. Notice the differently shaped fore grip and muzzle. Personally, I think the production model looks much better. Over all, I dig the simplified, professional, “more grown up” feel of the box design. 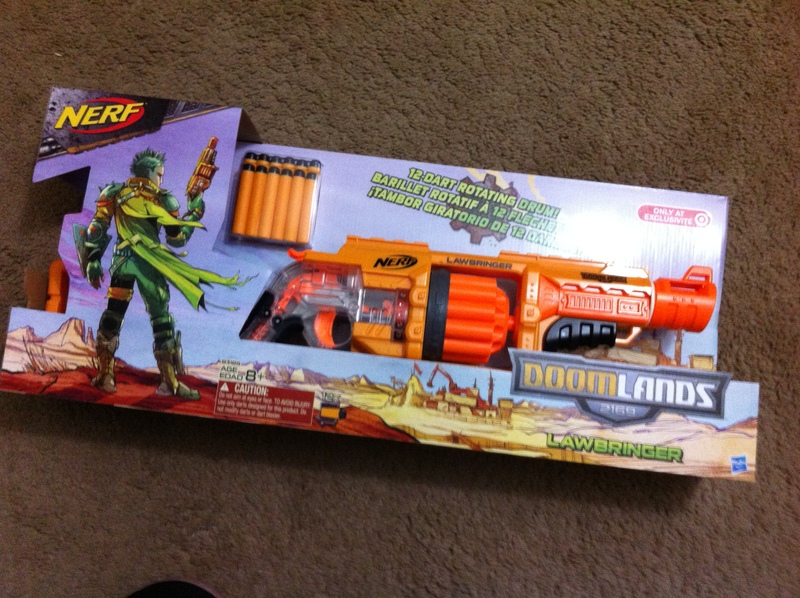 Hasbro’s marketing team nailed this one, but I didn’t buy this blaster for the packaging. Let’s take a look inside the box. I’ve said it before, the Hammershot is one of my favorite blasters. So, when news hit of the new Lawbringer, which is essentially a super-sized Hammershot with some post-apocalyptic flair, my interest was piqued. I managed to track one down at my local Target. Let’s take a look. The other day I happened across some K-Force products at my local Toys ‘R’ Us. I snagged one of the inexpensive models out of curiosity. 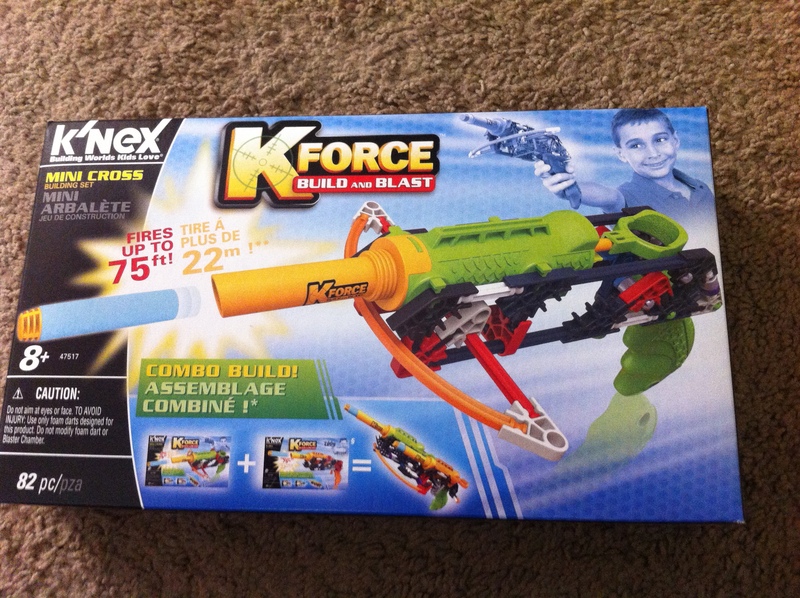 Here is my review of the K’Nex K-Force Mini Cross.